Continuing with the year-in-review series, I am going to take a look at the International markets in this post. USA was the best house in a bad neighborhood (Exhibit 1). In fact, every foreign flavor had a negative return, after 2017 being a banner year across the board! $USD dollar’s rise made the unhedged international ETFs even more negative. It should be noted that U.S. dropped the most in the fourth quarter as the regime changed from “whistle past the graveyard” to “growth concerns”. 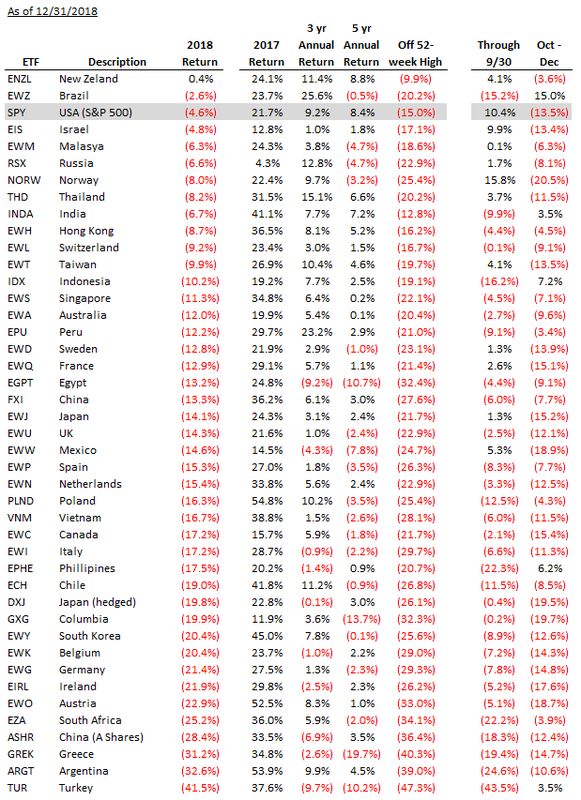 Exhibit 2 is more granular and shows the performance of single-country ETFs. New Zealand was the only major country that squeaked out a positive return in 2018. Brazil, U.S. and Israel did ok with drops under 5%. At the bottom we have Turkey (ouch!) and Argentina with country-specific issues. China is also down there as trade wars and hard landing concerns are starting to bite. There is a number of western European countries towards the bottom as trade tensions and stubbornly weak growth remain concerns.